Ted Scudder, a social anthropologist and fixture on the Caltech campus for more than 50 years, is one of the world's foremost experts on large dams. He's also one of their fiercest critics. That wasn't always the case though. Early in his career, he, like many people at the time, saw big dam projects as a societal good and a path to prosperity for developing nations. His experiences over the next six decades, especially with the people who were displaced by the dams, changed his mind. His new book, which bears the no-nonsense title Large Dams: Long Term Impacts on Riverine Communities and Free Flowing Rivers, chronicles a long career spent studying overlooked peoples in Africa, the Middle East, and Asia, and his growing disillusionment with the dam projects on which he consulted. We sat down with him recently to talk about the experiences that turned him from dam proponent to opponent. How did you, a social anthropologist, become an expert on dams? When I was young, I wanted to be an ornithologist and a mountaineer. I went to Harvard because I wanted to join the Harvard Mountaineering Club. Once I got there, I became the club president and I also was being trained by a professor of ornithology, so I was combining the two careers. My professor wanted me to shoot and stuff a number of additional species of birds for his collection. To make a long story short, I shot one bird as an experiment, to see how good I was going to be at stuffing the skin. I looked at that bird and I said, "To hell with this. I'm not going to spend time shooting what I love." So, that took care of my ornithology career. However, I still had every intention of using mountaineering as a career, and in the 1950s I pursued a job with the Arctic Institute of North America, which did a lot of high-altitude glaciology work. But the week before my family and I were supposed to move to the Institute's Montreal headquarters, I got a telephone call saying that my job had been eliminated. Why? Because my future boss's wife and daughter had been staying with him in base camp high on a mountain range in the Yukon where he was conducting research. They insisted on leaving in bad weather so that they could get to New York for the daughter's debutante outing. Their plane took off and it hasn't been seen since. My future boss was so discouraged by the loss of his daughter and wife that he stopped the whole project. So the question I faced was, "What do I do now?" I mean, I didn't go to college to take studies, I went to college to climb mountains. 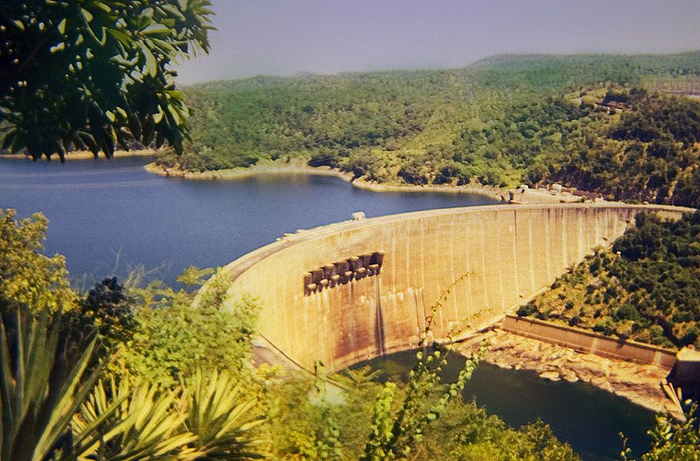 The Kariba Dam on the Zambezi River. Your wife suggested that you pursue graduate studies, so you enrolled at Yale studying world religions and Africa, and then at Harvard, studying anthropology. Where did that path lead? I had decided I wanted to concentrate on Africa, but when I got to Harvard, I found out it had no African courses at that time. Boston University had just started a very good graduate program in African studies, so Harvard allowed me to take one course there. I was planning to write my PhD thesis on the only African tribe that lived in high snow-capped glacial mountains so I could combine mountaineering and anthropology. But my professor and mentor at Boston University, Elizabeth Colson, told me I might want to join her on a benchmark study of the first large dam on the Zambezi River in the African Rift Valley. So, we went to work for the British Colonial Service in Zambia. They gave me a salary of £5,000 and a Land Rover. Early in your career, you were in favor of big dam projects. What were the benefits you saw? The magic sentence back then was, "The dams are a wonderful way to carry out integrated river basin development and improve the lives of the people who live in that river basin." Our baseline study began in 1956. We went back in 1962 to see what was happening to these people who had been displaced, and it looked pretty good. Their income was beginning to improve. 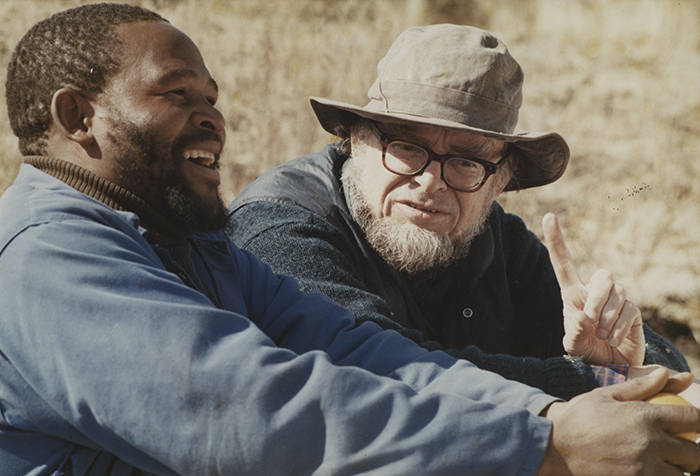 Ted Scudder, chats with a man during his field studies in Africa. Why did you become disillusioned with these projects? By the mid '70s, I realized all the wonderful things people said could be done with dams weren't happening. The people displaced by these dams are often ethnic minorities with their own religious and social systems. These were people who were very poor to begin with, but they were self-sufficient. It turned out the governments weren't really that interested in the welfare of the very poor, rural people displaced by the dams. What kind of problems do these dams create? Why are these people who live along the rivers worse off after a dam is built? The most important resource for them is the river, and especially the rise and fall of the river. As the river level drops during the dry season, they grow crops along the river banks. If they are cattle people, they lose out because during the dry season, when there's no more grass out on the plains, you drive the cattle down to the rivers and they graze on the grass that grows along the banks. When you build a dam, the river level doesn't rise and fall like that, so there is no longer a place for these people to grow their crops or graze their cattle. In the book, we estimate that today about half a billion people downstream from large dams are worse off because of them. Another 40-50 million have been forcibly relocated. That's a significant number of people who are being disadvantaged by these projects. Then you have the ecosystems affected by dams, especially the forests in the upper reaches of the rivers and the deltas and wetlands further down. Large dams tend to destroy all three. Look at the Mississippi, for example. Dams have been responsible for many of the hurricane problems affecting the lower Mississippi and the delta is being increasingly destroyed. In Egypt, because the Aswan High Dam's reservoir annually retains over 95 percent of the river's sediment, the Mediterranean now is encroaching into the Nile Delta. That delta supports somewhere between 40 and 50 percent of the people of Egypt, and it's being destroyed. What is the Egyptian government planning to do? Relocate the people who live in the Nile Delta. And where are you going to relocate them? Back to the desert because there's no other place to relocate them to. It's grim. With all those problems, why do countries pursue large dam projects? Some are cost-effective for the first 50 or so years. They're a good source of electricity. And when it comes to irrigation, large dams are pretty hard to replace. For electricity, I would prefer to see countries use tidal electricity, solar, and wind electricity, and if such options are inadequate, dam, as an example, only river tributaries. For irrigation though, dams are unfortunately hard to beat. One thing you can do is put more emphasis on ground water, but the trouble with that is that all over the world, whether in China, India, or California, we're not managing our ground water properly. We're just drawing it down, down, down, and we're not recharging it. It's going to be a major problem in agricultural areas like Central California. Late-developing countries are seeing rapid population increases. Egypt's population is just soaring, but the countries upstream of Egypt also have growing populations, and they want more of the Nile, so they're building their own dams. The Ethiopians have just built a large dam on the Blue Nile which will reduce the water coming into Egypt. These dams are terribly threatened by climate change because the weather is becoming more extreme. When you have a hurricane or a typhoon coming, you have to release a lot of water, and that's going to be bad for the people downstream. Or maybe the dam busts and ends up releasing all that water anyhow. A recent typhoon destroyed a dam under construction in a Mekong River tributary in Laos and 13 downstream villages, with over 13,000 residents, were devastated. We also will have more droughts. Lake Mead behind the Hoover Dam is at less than 40 percent of its capacity now. California is going to be more and more in conflict with Arizona, Nevada, Utah, and Colorado for the use of the Colorado River. Climate change is going to make the situation with large dams even worse and I don't really see any good solutions. Ted Scudder, professor emeritus of anthropology, in his office.